Grant got the racing bug back in the mid 80’s while working for ICI (British chemical company) that sponsored the Williams Honda F1 team with drivers Nigel Mansell and Kiki Rossberg. He was part of the customer hospitality team at the North America F1 races. ICI also sponsored Tommy Kendall and Max Jones in the SCCA Trans Am series where they drove Chevy Berettas and then the Ford Mustangs. Grant got to know all the drivers over the course of 2 summers but it was Tommy Kendall who really inspired Grant to want to go racing. Of course, everything else in his life after that got in the way of racing until 2004 when he decided to do something about it. Grant started racing at the age of 50 doing HPDE events and immediately switched to Spec Miata after chatting to a Spec Miata owner. 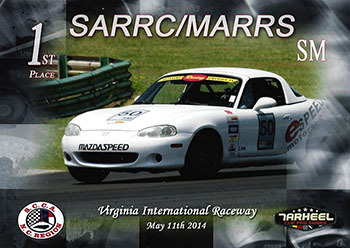 He stated racing a 91 but now has an 01 built by Mike Rossini and Espeed Motorsports. 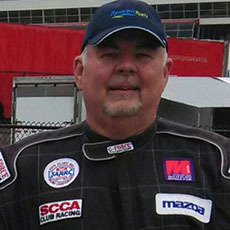 VIR is his home track but he has raced at Road Atlanta, Roebling Road, Summit Point Mid-Ohio and Nelson Ledges. “I am very lucky to have a supporting wife of 34 years who travels with me to most of my races and our 26 year old daughter Meghan often comes to watch too.